Near Anchorage, the roadless hills and swamps of the Yentna River Valley in Alaska have for years covered the tracks of Bear Whisperer Charlie Vandergaw's life. For the first time ever, cameras were allowed into Charlie's Bear Haven, and STRANGER AMONG BEARS reveals the isolated life of the retired Anchorage science teacher who has received national attention for his unique but controversial relationship with the black grizzly bears. Follow the bear enthusiast as he befriends black grizzlies but antagonizes authorities in STRANGER AMONG BEARS. For more than 20 years, Charlie has been living with wild bears in the Alaskan wilderness. 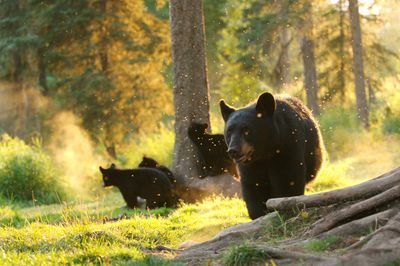 STRANGER AMONG BEARS follows the bears' season from their arrival at Charlie's Bear Haven in spring to their departure in autumn. 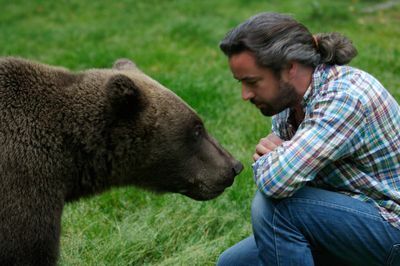 Bucking public opinion that grizzly bears are vicious wild animals, Charlie develops a contentiously close relationship with the black grizzly bears that live near his isolated cabin, where he has gone beyond the realm of feeding the bears to taming and training them. 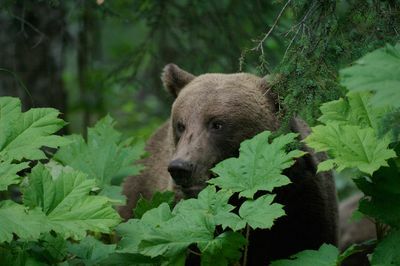 Living with Charlie and the bears is cameraman Richard Terry, who brings a lifetime's passion for nature to the series. 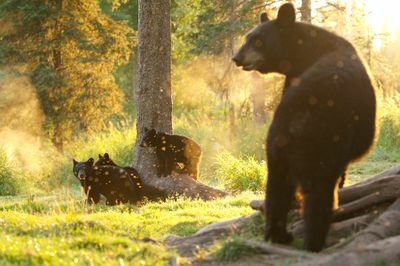 Together they record bear behaviour in a way never done before and reveal a kinder snapshot of some of nature's most revered, intelligent and powerful beasts. 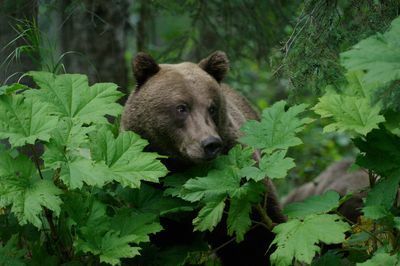 But even as both men find themselves drawn into this extraordinary world, the Alaskan authorities are clamping down on what may prove to be Charlie's last year as the STRANGER AMONG BEARS. 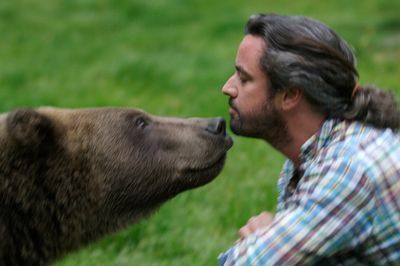 Richard receives a rude welcome to Bear Haven when he finds himself caught between a mother black bear and her cub. Under Charlie's supervision, Richard soon learns that there is no room for mistakes when dealing with these dangerous predators. The tranquility of Charlie's life among the bears is shattered by the arrival of two trespassing hunters. A tense altercation precedes a transformative experience for both Charlie and the hunters. Several weeks into the bear season, Charlie still hasn't seen any grizzly bears around Bear Haven. Their eventual arrival changes the atmosphere for the worse as the powerful beasts stake their claim to the territory surrounding Charlie's cabin. A recent change in the law has made feeding bears a serious offence and Charlie could end up in jail if he continues to defy the authorities. A legal loophole may allow him to avoid prosecution but it also raises the ire of those who seek to shut him down. 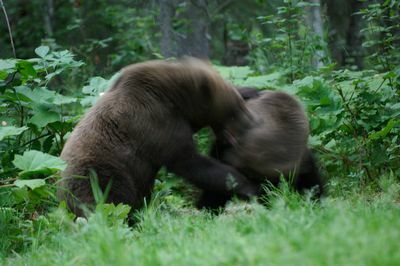 Living side by side with black grizzly bears is becoming more and more difficult for 70-year-old Charlie. As the bears start tearing apart his cabin, Charlie faces the unthinkable: is he getting too old for life among the bears? Could Charlie's extraordinary life living with bears in the Alaskan wilderness be coming to an end? Increasing pressure from state authorities, including a raid by state troopers, threaten to undo his life's work. As winter closes in, and Charlie prepares to return to civilization, he might be saying farewell to his beloved bears for the last time.